Last night, the Cold Readings Series (CRS) hosted a reading of my new full-length play, “A Modern Superwoman”. CRS usually focuses on film scripts and mostly reads extracts. This is only the second time they’ve read a full-length script; the first was the screenplay for “41”, which was released as a feature film last year. “Superwoman” is in its fourth draft at the moment. I’ve been developing it for a while now, but most the script was written in the last twelve months. Some of the scenes that were read last night, were only written last week. 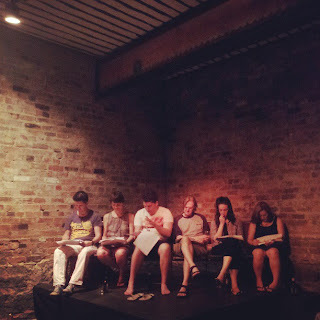 After the third draft, I got some feedback that suggested the play was underwritten – that connections between the characters were vague and their relationships suffered because of that. In this latest draft, I’ve tried to making everything a little more explicit – without spelling everything out. And at this stage, it’s been very helpful to just lay everything out clearly. I can always pare it back later. The reading was helpful to hear what was working and whether bits were overwritten and how strong the connections between the characters are at this stage. What’s also great about the CRS, is the post-reading discussion. The actors give their feedback to the writer. The audience gives their feedback to the writer. And the writer tries to stand there not looking too defensive or like a deer in headlights. I found the discussion very helpful, given the play’s subject matter and the tricky balance I have with a couple of the character’s stories. The post-official discussion discussion is much more relaxing, but also helpful – even just as an ego boost. I find at that point, people are happy to discuss what they really liked about the play, rather than in the discussion when they feel like they want to highlight the flaws first up. In all ways, this is still helpful. There’s no point being there if you’re just after praise. The point of the reading is to make the play better and having heard the play and the discussion, it definitely will. Thanks to Fiona Bulle and Serenity DeAngeles at CRS and to everyone who came along to read and talk after. I don’t consider myself a theatre critic or reviewer. My blog is about the theatre I make and the theatre I see. I don’t write about every show I see. When I do write about the shows I see, I don’t necessarily consider them reviews. The three-in-one post I made yesterday about three shows I saw in the last week is a good example of this. While there are comments about all three productions, I guess the compare-and-contrast style won’t be that helpful to people who haven’t seen the other shows or who have no interest in seeing them. I see shows to continue to further my theatrical education, as well as to support other independent theatre-makers in Melbourne. Most times, I pay to see shows. Sometimes, I’ll get a comp from a friend. Sometimes, I’ll be invited to a show because of the blog. Whatever I post on here will be honest, whatever my circumstance – whether it’s a mainstage production or if it’s a show I’ve seen just because there’s an actor in it that I know. Because I’m not a critic, I pick and choose which shows I write about at a whim. This most recent “review” post came about because the hook of seeing three shows in a week about couples. After seeing “Constellations”, I could have written a thousand words on it alone, but I’m not a critic. I don’t feel the need to write about every show I see – even a show I loved as much as that. But in an exercise to compare three somewhat similar - though on a very basic level - plays, I was moved to write a little something about them all. Because of that, I only touched on certain elements of each production – and didn’t try to cover them in as much detail as I would if I’d written indivdual reviews for each. This blog is primarily about my theatre-making and my theatre watching. It is not a theatre review blog. If you want me to review your show, I make no promises. I never want to feel obligated to write a review. I mostly write about shows I loved, but if I didn’t review your show, it might not be that I didn’t love it, it might be that I didn’t have time or I just couldn’t find the hook for me to write about it. Sometimes it’s tricky as a theatre-maker in a community that feels so small to be honest when writing reviews, especially when they are made by people I am friends with. So, the only promise I make is that when I blog about shows, I’ll tell you what I really thought. Relationship drama: "Constellations", "Danny..." and "The Shape of Things"
There’s always something potent about a two-hander about people meeting. We can all empathise with the simple, often relatively benign moment, when we first meet someone. When we first introduce ourselves. When we first start a conversation just to see what happens. It’s a dramatic cliche that instead of having someone come through a door, have them come through a window. But how we meet peopple isn’t always dramatic, but in many ways there is always the potential for dramatic tension. I’ve seen three plays this week about two people meeting and how their relationships develop over years, one night and several months. 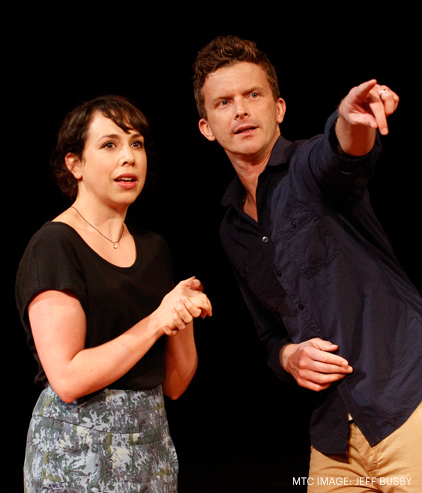 The Melbourne Theatre Company is currently staging “Constellations” by Nick Payne. Bridget Balodis’ production of John Patrick Shanley’s “Danny and the Deep Blue Sea” is on at Rancho Notorious, above 1000 Pound Bend. And RoundSquare’s first show is a production of “The Shape of Things” by Neil LaBute, at the No Vacancy Gallery at QV. While only “Constellations” and “Danny” are actually two-handers, “The Shape of Things” turns on the relationship of one couple – Adam and Evelyn, ably supported by the compare-and-contrast relationship of Phillip and Jenny. In “Constellations”, Marianne and Roland meet. And meet. And meet. And meet. And we see many derivations of their relationship, seeing how their lives together (and sometimes not together) would differ based on the choices they make along the way. Marianne is a theoretical physicist and she explains the “many worlds” theory of the universe, to make just a little bit of sense out of the non-conventional structure of the play. But the key to the play is the sweetness and the lightness of touch. We may be all at sea to how all these various threads connect, but in each encounter, we empathise with these two characters. Meetings can be easy, they can be awkward, they can be rich and funny or dull and forgettable. And some of these meetings can lead to friendships or relationships or to nothing... but you never know which will lead to what. And so on. And so forth. Letitia Caceres keeps the show tight but allows the actors to really strut their stuff. We are engaged by Alison Bell’s lovable awkwardness in many of the iterations of Marianne, just as we are drawn to the sometimes lost and sometimes strong Roland, played with marvellous dexterity by Leon Ford. The characters at the centre of “Danny and the Deep Blue Sea” are much tougher – in appearance, in temperament and physically, violently stronger. But as much as Roland and Marianne must choose the right things to say to each other in the many worlds they encounter each other, Danny and Roberta need to find the right words to even talk to each other. Danny is a violent thug; he might even be homicidal. Roberta is a single mother, living with her parents, having trouble coping with everything life has thrown at her. And these two meet in a bar, but worlds away from the “meet cute” of “Constellations” or a million Hollywood romantic comedies. The relationship between Danny and Roberta is brutal – in physicality and language. But they aren’t difficult to empathise with. First meetings can be fraught, even when we go in with eyes open. When the two people are as bruised and broken as these two, there’s a dramatic tension from the opening moments. Bridget Balodis’ production is tight and moody; the Rancho Notorious space is perfect for the seedy bar where this couple meets and the cramped bedroom they find themselves in later. Olivia Monticciolo and James O’Connell are strongest in the middle portion of the three-scene, sixty-minute play – but that’s where Shanley’s writing is strongest, too. When the two characters are letting their walls down, after their pants have come down, we get to see their vulnerabilities – which is often a dramatic key for getting characters together, but in this instance it begins as a catalyst to tear them apart. Where Danny and Roberta’s relationship is based so strongly on their physicality – the way they hold and carry themselves, the couple at the centre of “The Shape of Things” begin their verbal and intellectual sparring at minute one and the cerebral sparring continues throughout Neil LaBute’s treatise on art and how appearance and relationships might change us. Adam and Evelyn meet in an art gallery; Adam is a guard, ostensibly there to protect the art and Emily is an artist and anarchist, there to graffiti and piece of art she believes “isn’t true”. What is and isn’t true is often the key to us meeting; putting our best foot forward, willing ourselves not to make a fool in front of these people, occasionally we’ll throw in a little white lie – to keep people interested. They key to Adam and Evelyn’s continued interest in each other is definitely the verbal sparring; these are college-age kids in a small college town – intellectual rigour is a kind of mating ritual. In contrast, Adam’s friends Phillip and Jenny seem to still be together because it’s what’s expected – even as they express doubts in the relationship, they think they should take the relationship to the next level. As often with LaBute’s plays, human relationships become an intellectual cat-and-mouse game. Sometimes this leads to characters who are cyphers to ideas, rather than fully-rounded emotional human beings. But the relationships in “The Shape of Things” are complicated and layered – and as we see different combinations of the two couples meeting, we begin to get a fuller understanding of who they all are and what parts they play in the drama. I was intellectually-engaged throughout, but not emotionally engaged until the climax of the piece – with Emily Wheaton’s stunning performance, as Evelyn gives the key address of the play. And as we unlock the secrets of the play, LaBute has a lot to say about how we use art, perceive art but also how we perceive people and how we use them, too. Peter Blackburn’s directorial debut is populated by a strong cast in a great space (this show performed in an art gallery when the key pieces of work in the current display are inspired by “The Shape of Things”), but the pacing is a little off in the first half. The scene transitions are lengthy and the structure of LaBute’s work require real pace throughout; it’s one thing to nail the scenes, but if the scene changes drag, we lose some of that dramatic tension in the experience. Luckily, the second half barrels along and the climax and final scenes between Wheaton’s Evelyn and Josh Blau’s Adam are a joy and a heartbreak to watch. Sometimes we must choose our words, choose our actions and choose how we hold ourselves. Sometimes, if we choose all three, we're bound to make an impression. “Constellations” plays at Fairfax until March 23. “Danny and the Deep Blue Sea” plays at Rancho Notorious until March 16. “The Shape of Things” plays at No Vacancy until March 24.